*This story was written by Jeff Hoard for Digital First Media. Reprinted with permission. If you love Lego games and comics, especially those from the Marvel Universe, then "Lego Marvel Super Heroes" could be the game for you. The plot plays out like something you'd expect from a comic book mixed with TT Games' well-known Lego humor. Silver Surfer's surfboard shatters into numerous Cosmic Bricks onto Earth, and Doctor Doom brings together his evil buddies to retrieve them to create the Doom Ray of Doom. Nick Fury isn't having any of that, and he rallies the heroes in an attempt stop the madness one brick at a time. It doesn't waste any time getting to the action. 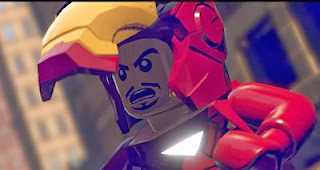 Players control Iron Man and Hulk in the beginning -- with a cameo appearance from Spider- Man -- to smash through enemies and stop Sandman from terrorizing Lego Manhattan. Missions are exciting, taking place in popular Marvel locations like Stark Tower, Asgard and X-Mansion. They can be replayed to unlock hidden areas only accessible with other characters during Free Play mode. There are also various side quests throughout the overworld to keep players busy. The formula hasn't changed much over the years for these types of games, and this Marvel version basically sticks to it. Missions are completed by solving various puzzles that involve specific characters' abilities. This means constant switching between them, which is simply done with the press of a button, but it can become tedious in some parts. Smashing everything in sight is recommended, since certain objects will need to be rebuilt to progress through a level, and it can be difficult to see where to go to next. The giant cast of characters is what will have players coming back to the game. The big shots are here like Iron Man shooting missiles and flying around; Captain America tossing his shield at enemies; Wolverine using his claws to slash out damage; and Hulk, who does what he's known for -- smash. But there are dozens of others including Deadpool, Thor, Jean Grey and Green Goblin to play with. It's like a giant Crayola box but with comic book characters to choose from in their charming Lego form. Even the legendary Stan Lee himself makes multiple appearances, similar to his numerous cameos in the movies. Unfortunately, there remains some technical annoyances that have popped up in past Lego games. I noticed a little bit of slowdown and frame-rate issues while traversing the overworld on the Wii U version I played. Very few times during missions, I or my AI teammates would get stuck in the environment, requiring a restart at a checkpoint. Platforming is still clunky, resulting in inadvertent falling off ledges. A little more polish would have been nice. None of these problems are game breaking by any means, though. "Lego Marvel Super Heroes" still delivers hours of fun and is a wonderful fan service to Marvel comic book fanboys. The Wii U version of "Lego Marvel Super Heroes" was supplied by the publisher for this review. It is also available for Xbox 360, PS3, PC, and is a launch title for Xbox One and PS4. Nintendo 3DS and PS Vita versions are also available.